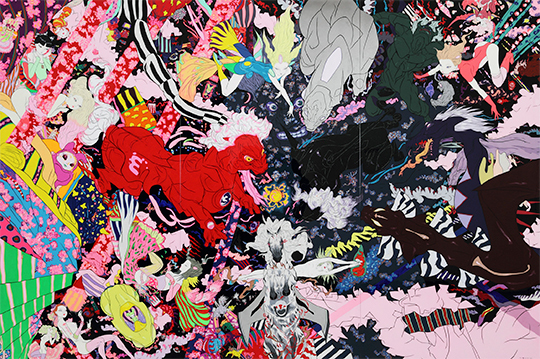 Mizuma Art Gallery is pleased to present TOKYO SYNC, a solo exhibition by Yoshitaka AMANO. Amano was born in 1952 in the city of Shizuoka and at age 15, he was hired by the animation film studio Tatsunoko Production. He participated in many character designs for series such as Time Bokan and Science Ninja Team Gatchaman. After establishing himself as a freelancer, Amano’s illustration work for the Vampire Hunter D novels and, especially, his character designs for the video game series Final Fantasy brought his name international fame. Far from being confined to Japan, the enthusiasm for his delicate, voluptuous and fantastic images has spread across the world, inspiring the next generations of creators in all kinds of fields. Amano ambitiously crosses disciplinary borders and has, among other activities, designed sets and costumes for both the stage and the screen, and produced movies. However it is the world of fine art which he has progressively positioned at the center of his activities since the late 1990s. Freedom from contracts and limitations deepens Amano’s natural creativity. He produces an entirely new world using various materials and the sensory stimuli received throughout his wanderings. His works with automotive paint on aluminum panels produced in quantities in recent years indicate the intimate relationship between our epoch and the mythological universe that Amano is creating. The world is dissolved and bound together in the artist’s original creativity in an ongoing sync-retic operation, sync-hronizing the artworks he produces with the era we are living in. In the series “DEVA LOKA” (the place where the gods are) which constitutes Yoshitaka Amano’s core body of artworks, monsters and gods overcrowding the pictorial plane blend together with mysterious machines in a world of abundance. Through this show, entirely constituted of new pieces from the DEVA LOKA series as well as familiar characters from Amano`s early career, we eagerly invite you to discover this Tokyo-born, ever-changing new mythology headed to the future.